For those with a disability, getting to church has been made a whole lot easier at Tweedsmuir Memorial Presbyterian Church in Orangeville. The church has completed a new accessibility project with the main feature being an elevator that goes from the lower level to the sanctuary level in the building. There is also a new accessible washroom on the main floor. Completion of the project was celebrated during a special dedication after Sunday’s regular church service. A lot of planning went into the project, which took four months to complete with initial construction starting in August of 2017. The concept was originally brought forward by organizer Ron Mikulik, a church elder and Chair of the Tweedsmuir Accessibility Committee. Mr. Mikulik pointed out that the requirements for the elevator included that it must be able to accommodate a casket during a funeral service at the church. 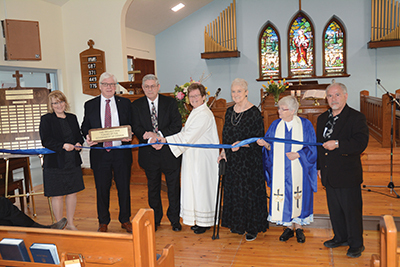 Several local dignitaries joined the congregations during the dedication ceremony.